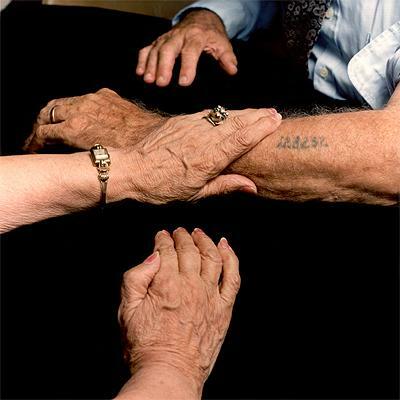 Holocaust Survivors: Photo Gallery - "Number: 128232"
Frieda Radasky holds the arm of her husband, Solomon Radasky, next to the tattoo of his Auschwitz registration number, 128232. The numerals add up to 18 which forms the word "life" in Hebrew. Mr. Radasky worked near the crematoria hauling sand to spread over the ashes of the dead. The Auschwitz numbers ran from 1 to over 202,000. Those selected for death were not registered in the camp and did not receive numbers.